It’s been three months now, so how is my beginner sewing plan going? 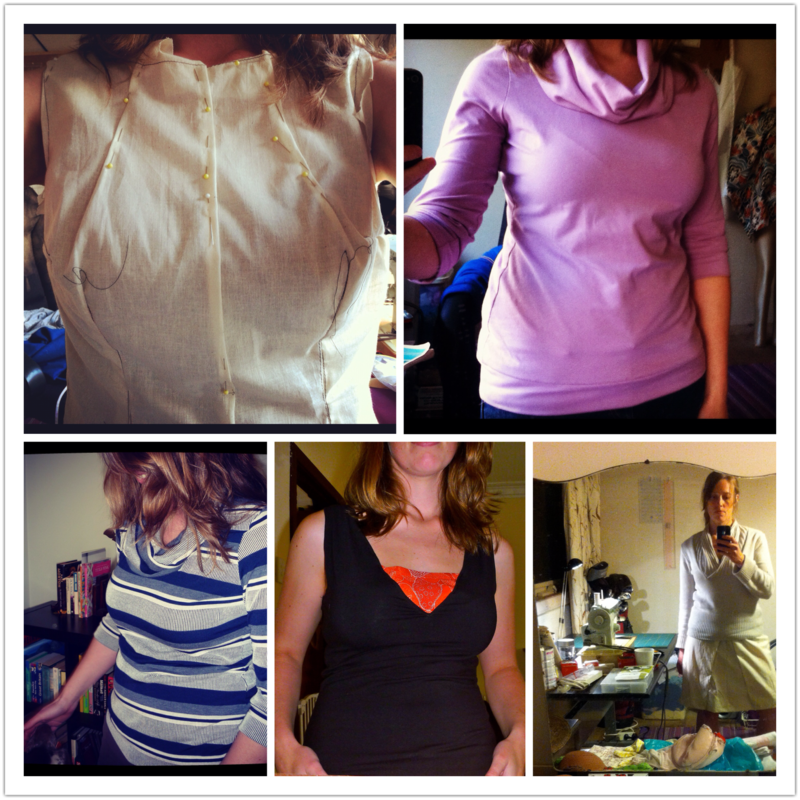 I set out to make 9 specific patterns to practise my beginner sewing skills, through a range of patterns and fabrics. What else have I made? What have I learnt from all this? The biggest obstacle to my sewing was my not understanding the full capabilities of my sewing machine, and the variation of settings, and remembering to change them all back again when I’m done…. Sewing with Knits was much easier than previous attempts as I learnt how my machine responded to a variety of knits. By forcing myself to try a range of knits close together, I’ve found that I could quickly troubleshoot when things went askew. Interestingly, the biggest thing I have learnt is not to rely on the sewing pattern (for most brands) for helping me achieve the best finish of the garment. Sure, it might be assembled correctly, but really sitting and making decisions about how to do my seam finishes and other details before I started cutting/sewing makes a huge different. Not waiting until I get to the line “and now finish your seams” to make a decision. By thinking about the fabric first, and then the pattern instructions I’ve got a clear idea of what seam finishes might look best, whether I need to change anything before cutting out, if I should do extra stay-stitching, understitching..do I want to line the garment? Underline, interline, there are just SO many choices. Should I hand stitch the hem, machine stitch, stitch to the underlining, or maybe even finish the seam with bias binding? It seems I make so many versions of the same pattern until I’m really happy with the final result. So really, beginner patterns can become intermediate patterns as there are so many ways you can improve/change them to suit your preferences and skill level. I think I have a long way to go, and I’m going to keep practising my skills of sewing before I even get to big fitting issues. No more quick fixes here, these are going to be quality garments! Part of learning to sew knits I decided to try the Heidi and Finn Cowl neck dress pattern. 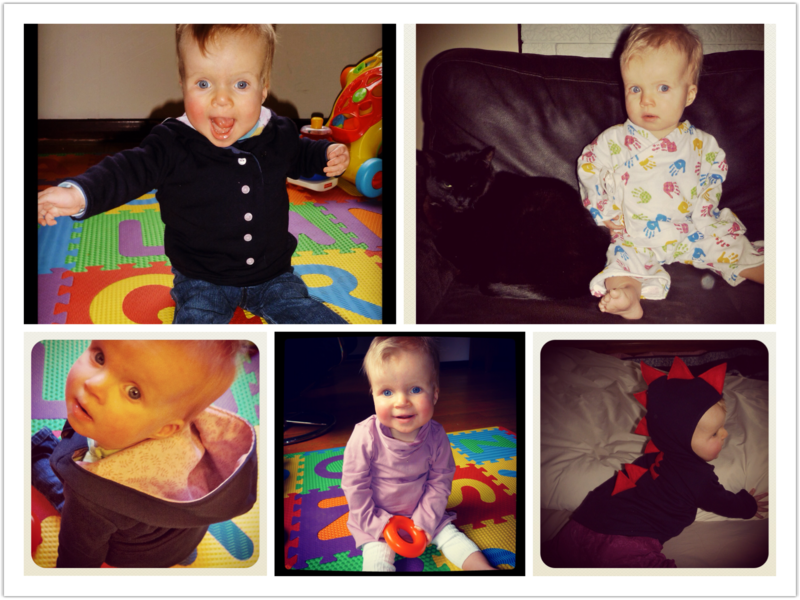 I’d seen some lovely dresses on ModelMumma‘s blog, and was keen to give them a try. It’s a very basic beginners sewing pattern. This was my WIP project which I sent a picture of to DidYouMakeThat last week. It was fun trying to work out what everyone was sewing! 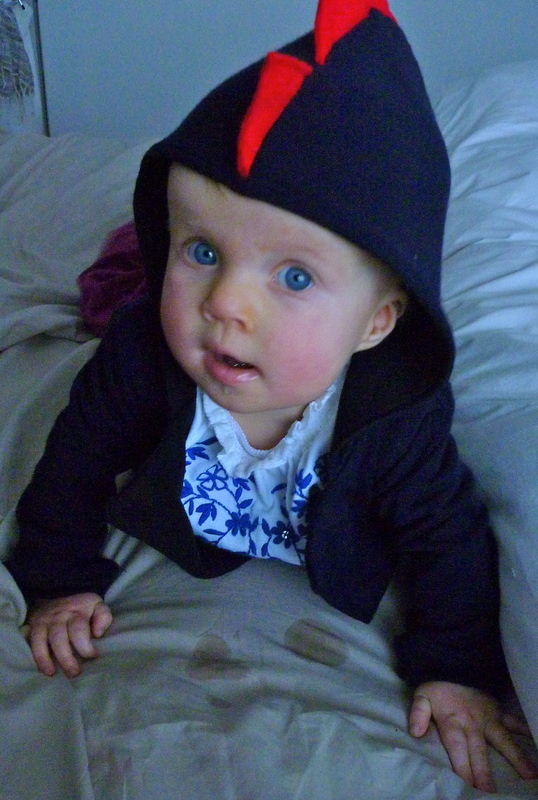 As a note to slightly clueless parents like myself – cowl necks catch baby drool. It’s gross, and very damp. 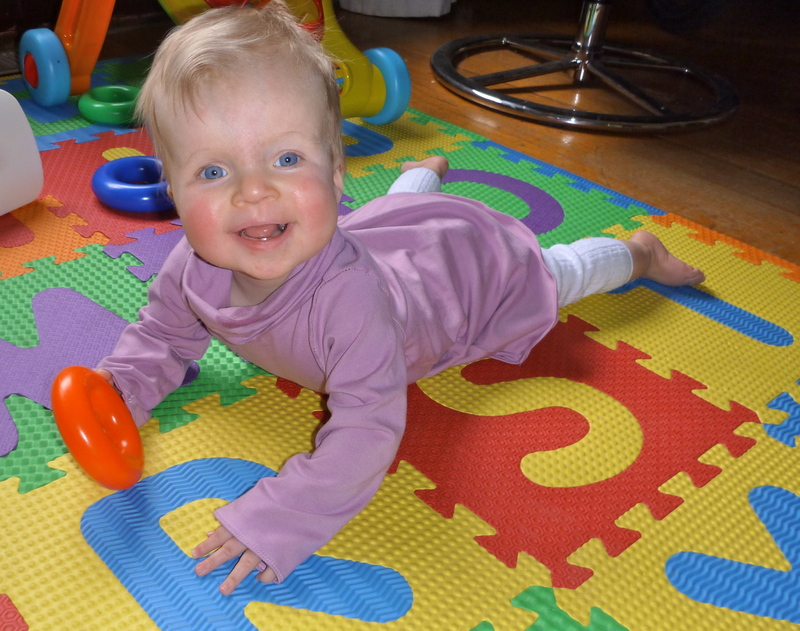 Maybe more of a pattern for children that can walk and keep their slobber to themselves. Oh yeah, and dresses are for those that can walk. It’s pretty cute on, and very fast to sew. Will be be a favourite? Probably not. Will it be a stash-busting childcare outfit? Definitely. I’m a little underwhelmed by this pattern, it’s very basic, not very interesting and still the instructions to put the cowl neck in are not as clear as they could have been. The finished result is nice, but the arms were much too long and the neckline was too small (and I cut a larger size than needed) and is difficult to get over her head. This would be remedied by using a very stretchy knit, but even still I consider it to be too small. Big disclaimer here, I also had this problem with the Heidi and Finn Hoodie, so either their sizing is a bit off, or my baby has a giant melon head. Anyone else had similar issues? Nothing too interesting, a pale pink interlock from Darn Cheap fabrics in Heidelberg, $7 per metre and this was made from the offcuts of my renfrew. Honestly after making the Hoodie, and the Sewaholic Renfrew this has no revelations. If you have sewn a renfrew before, it might be worthwhile self-drafting a new collar in a similar shape, as a shaped cowl drapes much better than the rectangle. I’m not in love with the pattern, but it is quick to cut out and sew which could make it a brilliant stash buster. The real win here for me is the fact I can cut out a renfrew for me, and a dress for her out of 2m of fabric. STASH BUSTER. The finish of sleeves and hems on childrens garments are really important, as kids roll up their sleeve and run about generally exposing more of the internal workings of garment than an adult. Next time I’m going to really finish those seams nicely. Hopefully by then I’ll have my grubby little mitts on my mother’s overlocker….. Thanks for the suggestions – a glass of wine was indeed had and everything is back in order – so here is the Heidi and Finn Hoodie version 3 – (a.k.a. 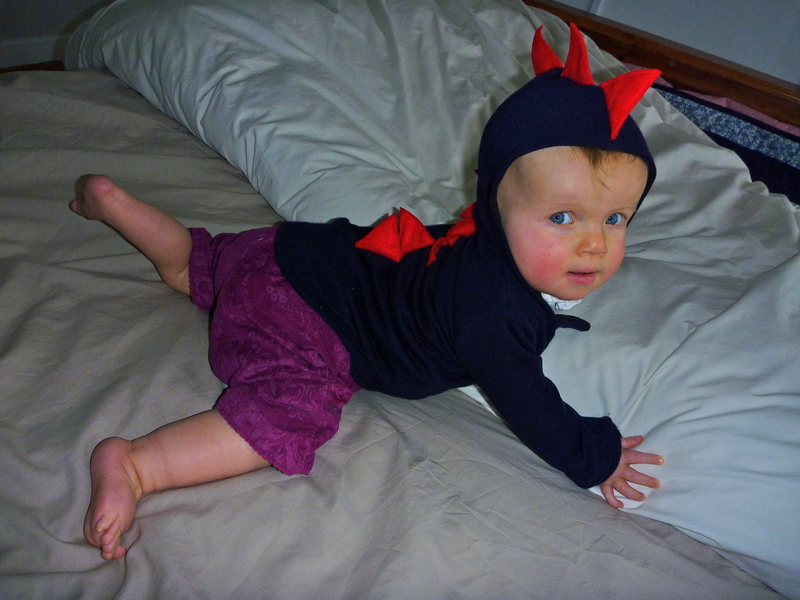 the baby dinosaur!). I’d have liked to model this on the baby, however as I’ve run out of black thread the front is pinned together, which is high risk for babies. 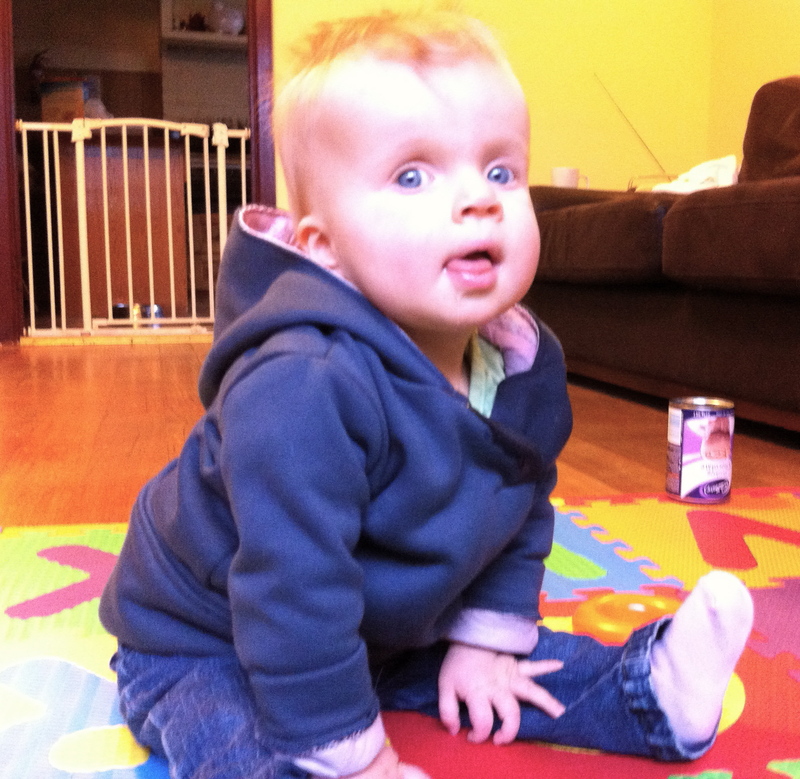 The baby isn’t mobile anyway, so “action shots” consist of variations of sitting. And by variations I mean changes in flooring. The sitting is pretty standardised. Here we go! 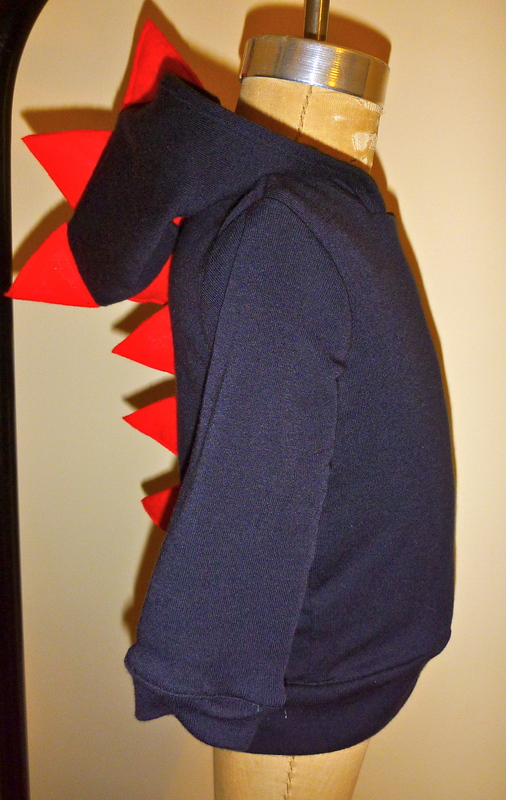 This is a combination of the Heidi and Finn hoodie and the dinosaur tutorial circling the interwebs (and it’s so awesome how could it not) from here, here and then here. Adding the little scales was super easy, and used up some red felt that is usually just used for tongues on stuffed animals. Toy tongues are tiny, so there was shedloads left just dying to be used up. If you’re wondering how much felt I needed for this, it was about half an A4 sheet and it’s a size 0 hoodie. The hoodie just needs topstitching along the seams and down the front and a button sewn in, however I’ve run out of black thread. Seriously. I ran out of neutral thread earlier this week, swapped projects, walked 2km in the rain with the baby to get more, and then get home to realise I need more of the black. *sigh* It wouldn’t be a problem except, as you may very well know it’s rude to go to a fabric store and not buy fabric. TRAGEDY. This being the third in the series of baby hoodies, I’ve finally jigged the fabric and the techniques to get the desired results. It’s not quite RTW quality, but that’s more due to not having an overlocker and some of the internal seams not as pretty as I’d like. Some of the seams look a little wobbly at the moment but they just need a press and to be topstitched and they’ll look great. The fabric is a jersey with approx. 50% stretch from Darn Cheap Fabrics in Heidelberg, with the lining being an interlock with approx 25%, with the waistband and sleeve bands also being the jersey. In theory it shouldn’t work very well mixing the two fabrics, but so far the interlock gives it a bit of stability and holds a nice shape. It might not wash up very well depending on how slack the jersey may go in the wash. The only reason I mixed the two was I had interlock offcuts, and I was curious. 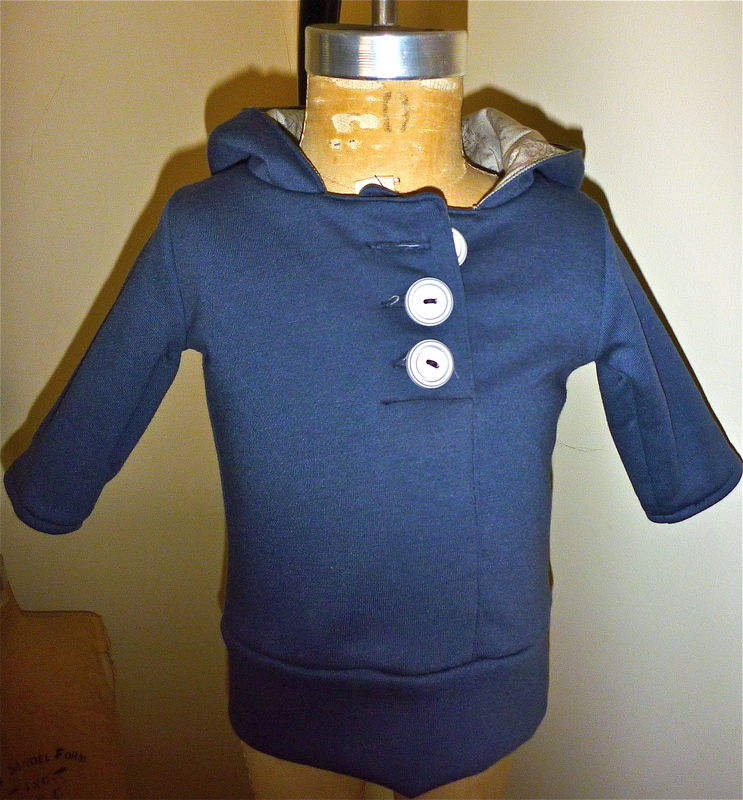 The fourth hoodie (yes, there is a fourth planned – kiddo is going to childcare a few days a week soon) is jersey outer and inner. The comparison between the two will be interesting. Sewing the lining and outer together (with right sides facing), flipping it inside out then attaching the waistband makes for a very bulky seam, that then needs to be topstitched down. Instead I sewed the side seams together, then flipped it inside out. Then on the right side I topstitched down one seam, changed to a long basting stitch along the bottom (sewing the outer and the lining wrong sides together) then as I hit the corner changed back to topstitching up the other side seam. Once the front is then topstitched creating the overlap of the front panels I added the waistband. I also changed the waistband and armband widths. When you look at a normal jumper with waistbands and armbands they are slightly smaller than the arms/torso of the jumper. By cutting them 10% shorter and gently stretching the arm band as you sew it to the jumper this gives you the narrower bands around your wrist. It’s funny how you never think about why jumpers have arm bands and waistbands until you sew one. This only really works with knits with a reasonable amount of stretch. It wouldn’t work with the fleece unless you used a co-ordinating rib knit. Interfacing where the buttonhole will be, just for a little extra stability in the buttonhole. I cut a small piece about 3″x1.5″ and applied it to the wrong side of the lining. The topstitching was done with a twin needle, which if you haven’t tried one is actually super easy. Or is on my sewing machine. It gives a little stretch as the bobbin does a zigzag pattern on the underside, but best of all the double lines is a bit visually deceptive and your stitching looks straighter. As you subconsciously compare a line of stitching to the closest parallel line the twin needle is a winner. Is it wrong to want one of these for yourself? One of the items I want more of for myself, which is hoodies! Yes, very couture, but it’s winter here in Melbourne and warm is good. Unfortunately the hoodie pattern is still elluding me, but in the meantime the practice garment is the cute Heidi and Finn hoodie! 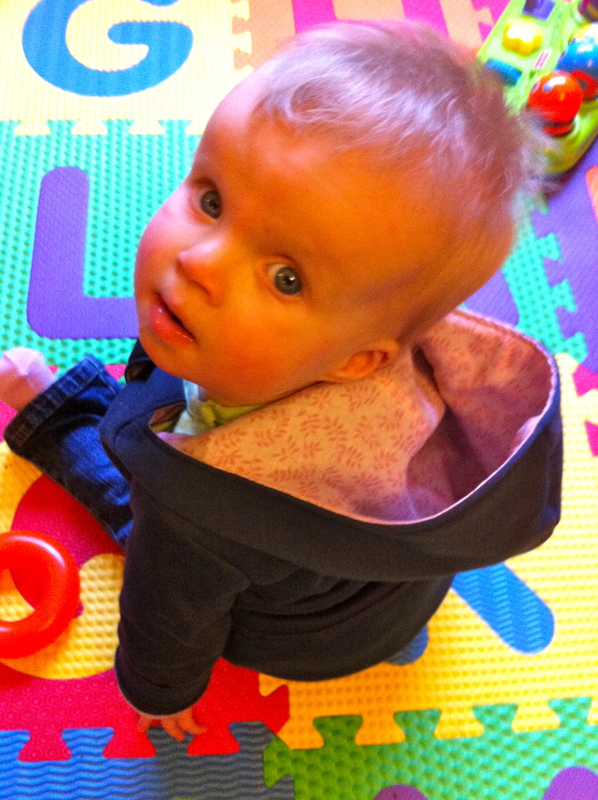 So far two hoodies have been made, one in size 6m to 12m, and one 18m (the one with the pink lining). The pattern isn’t the most professional looking, however for a beginners pattern it’s a good thing. The directions have colour photos, and for an absolute beginner the lack of technical terms would make this simple. The grainlines aren’t marked, you cut it out in the direction of the ‘stretch’. I would absolutely recommend this as a learn to sew item. However, there are a couple of things I would change. From the picture it looks like a fleece hoodie right? It’s t-shirt material, so if you want to use something with limited stretch you need to cut it a size larger. Which it does say in the instructions, but then you need to omit the cuffs as the arms won’t fit, so really you need a larger size bodice and hood, but to use the smaller lengths. After cutting both sizes, the one that now fits around R’s body is too long and the collar hits her in the face. While I wouldn’t think a fit issue that’s my fault (for fabric choice) would be worth mentioning- however as it’s a jumper so I expected to use jumper material for warmth. The only other issue is how you attach the binding down the bottom of the hoodie. The pattern has you sew the lining and fabric together, turn right side, topstitch out THEN attach the band. You end up attaching the band to a bulky enclosed top stitched seam. Why? The next one (version 3) that I make, we will be skipping some of that. It makes little sense especially if you had an overlocker to use. 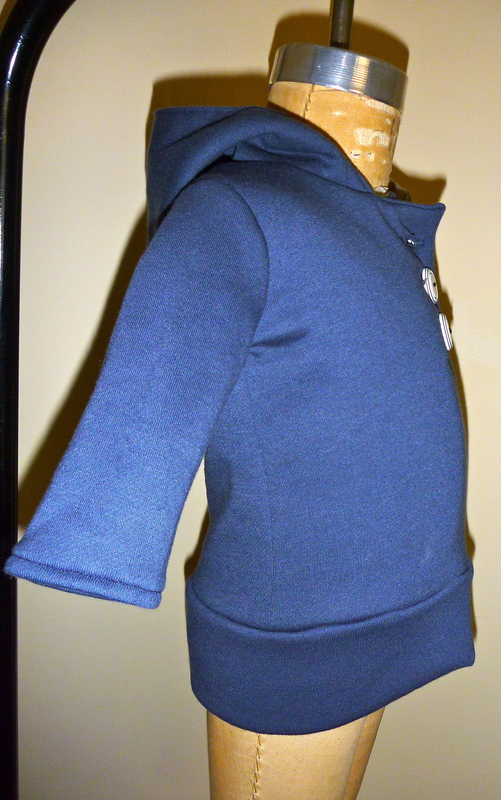 This is version 1 of the hoodie, which is a fleece cut in size 6-12m. Little podgy bubba doesn’t fit in it with the limited stretch, so I’ve taken the bottom band off completely and unstitched the topstitching below the buttons. It’s more like a fleece coat now, but it fits. This is version 2 of the hoodie, same fleece but cut a size larger. The fit is fine for fabrics with lots of stretch, but a little snug for a fleece. The instructions recommend just cutting a size larger, but the sleeves are then HORRIFICALLY long. 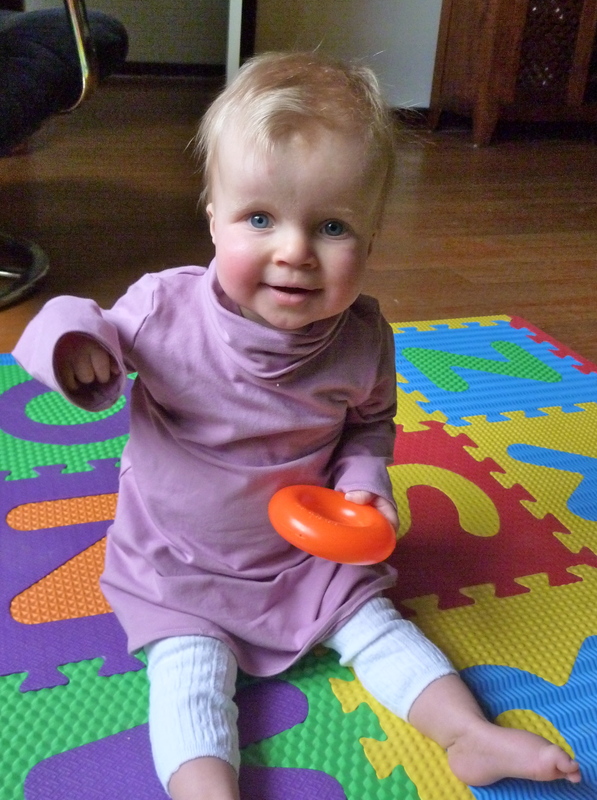 Fleece is lovely and easy to sew. A little bulky on some seams, but the old singer handled it fine. It’s also beautifully easy to cut the pattern on grain correctly if you cut on the right side. Ahhh, practicing topstitching was a key feature of this pattern and buttonholing. I’ve been using the completely machine method as per the 1980’s Readers digest guide to sewing (pre-fancy pants automatic buttonhole attachments). They came out ok however for the next hoodie I’ll stabilise the buttonholes. There is a few. Let’s make a list shall we? 1. I love Heidi and Finn patterns and would love to see these done up a bit more professionally (tech drawings etc) and being available as a paper pattern. 2. The next one I make will have more stretch and probably fit better. Fingers crossed! 3. I’ll rearrange some of the construction steps (I.E. putting the buttonholes in before topstitching is easier). 4. Small babies don’t like having jumpers being pulled over their heads. Or maybe just mine. When she can put her own jumper on there will be 20 of these made.